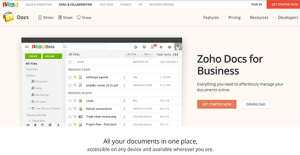 Zoho Docs is a cloud-based software designed to help you manage, share, and store all your files online. It serves as a collaboration platform and organizer of all your business files – documents, presentation, spreadsheets – and even your personal files such as pictures, movies, and music. Since it’s an online platform, you can access the software and all your files from a centralized location wherever you are online and whenever you need to. It’s like having your own personal file manager that you can bring with you on the go and retrieve or share your files from whatever device including tablets and smartphones. Aside from features for organizing, sharing, and storing your files and folders, Zoho Docs also gives you administrative control tools, synchronization and integration capabilities, and online collaboration. It also lets you sync files from your computers (Linux, Windows, and Mac) to the cloud, and vice versa, so you can search and work on the latest versions of your files on any local machines whether online or offline. The virtual drive likewise allows you to sort your files through folders and sub-folders and categorize files by whatever parameters you set such as by files type, by projects, or by author/owner. The Zoho Docs platform brings with it extended functionality through integration with Zoho Office Suite – a set of editing, presentation, and publishing tools. You can edit, write and publish documents online with Zoho Writer; use graphs and charts with Zoho Sheet; and broadcast interactive presentations to your audience anywhere in the world with Zoho Show. Meanwhile, integration with Google Drive and Dropbox enables you easy access to your files from these online storage services directly through Zoho Docs. The software is available in three affordable plans including a free plan for more than two dozen users. You can immediately take advantage of Zoho Docs’ capabilities via its feature-filled free plan that can be used by up to 25 users in your team, with each user getting a generous 5GB of storage. The zero-cost virtual drive gives you file versioning for up to 25 versions, admin controls, secure file collaboration, Zoho Office integration, mobile app, built-in chat, and email notification, among others. Various features and options are offered by Zoho Docs to ensure that you and your team work together more efficiently and productively. You get to track your documents as it goes through the whole process from creation to publication as well as control who get to see, access, and work on said documents. You can grant access to team members base on the function (co-owner, edit, read-only) and make online files visible to the whole organization, to the viewing general public (with or without password), or to specific collaborators. All the files that you share, edit and create online whether from your desktop, mobile phones, or on any browser is protected by robust security controls and protocols. Zoho Docs strictly complies with standards such as IDO 27001 and SCO 2 Type II. Physical security is enforced in servers and data centers including 24/7 security, verified access to said facilities, and distributed grid architecture for continued operation even in the rare case of server failure. In addition, data is guaranteed to be safe even in transit through encryption and TLS protocol. There are also multiple file backups and regular checks for spam, virus, and malware. Cloud storage with Zoho Docs comes with several capabilities – you can upload files by bulk or individually, upload files from 1GB to 25GB in size, and get from 5GB to 1TB in cloud storage. You can also organize and categorize your cloud files and send files directly to your cloud account via email or even through your scanner. Moreover, you can sync files in a snap from your computer to the cloud for quick files access and speedy completion of projects. You can work on the files in your desktop either offline or online and view changes from all your devices once you’re back online. You also get multi-level sync which means you can transfer/send files and folders to the cloud in their original order and form, and not mixed up. It is essential to note that hardly any software in the Collaboration Software category will be a perfect solution able to meet all the goals of various business types, sizes and industries. It may be a good idea to read a few Zoho Docs reviews first as some solutions can excel just in a very narrow set of applications or be designed with a really specific industry in mind. Others may work with an idea of being simple and intuitive and consequently lack advanced functionalities needed by more experienced users. You can also come across services that focus on a large group of users and provide a complex feature toolbox, however this usually comes at a higher price of such a software. Be certain that you're aware of your requirements so that you choose a service that offers specifically the elements you look for. How Much Does Zoho Docs Cost? We realize that when you make a decision to buy Collaboration Software it’s important not only to see how experts evaluate it in their reviews, but also to find out if the real people and companies that buy it are actually satisfied with the product. That’s why we’ve created our behavior-based Customer Satisfaction Algorithm™ that gathers customer reviews, comments and Zoho Docs reviews across a wide range of social media sites. The data is then presented in an easy to digest form showing how many people had positive and negative experience with Zoho Docs. With that information at hand you should be equipped to make an informed buying decision that you won’t regret. What are Zoho Docs pricing details? What integrations are available for Zoho Docs? If you need more information about Zoho Docs or you simply have a question let us know what you need and we’ll forward your request directly to the vendor.